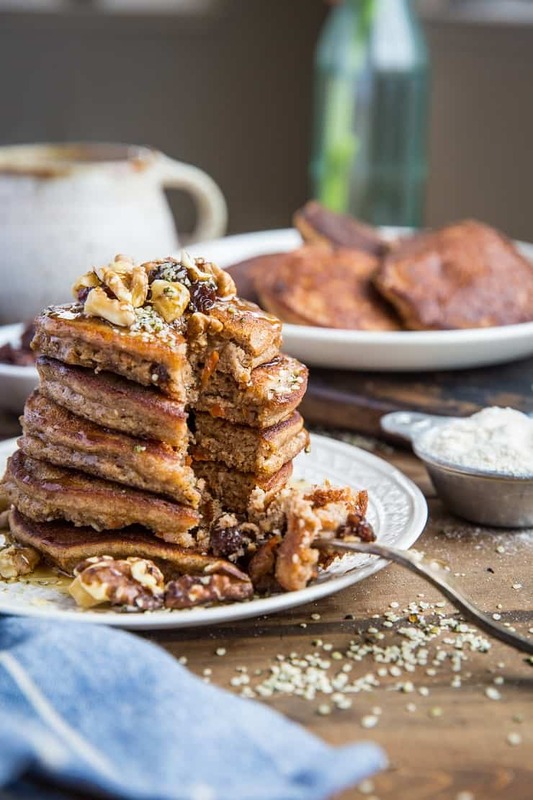 Moist and fluffy coconut flour paleo carrot cake pancakes made with coconut flour, coconut milk, and pure maple syrup. 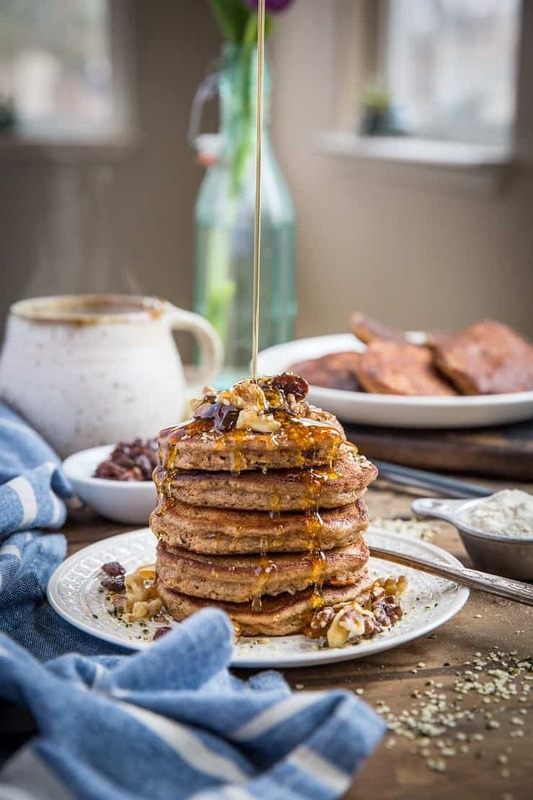 These flavor-infused carrot cake pancakes are perfect for a slow weekend breakfast, or double as a healthy snack. …Also known as that time we did a mash up of carrot cake and pancakes and called it breakfast. Sometimes you need to begin the week with something irresistible to let the weekend spill over just a little longer. Sometimes you need a different flavor to change up routine and make you feel funky fresh. Sometimes you need a place to put a vegetable to ensure your children nuggets consume a vitamin or two. Sometimes you need paleo carrot cake pancakes to remind you you’re free to do as you please while still making wise decisions. We’re gluttons for healthy hedonistic breakfasts. We’re no stranger to grain-free and gluten-free pancakes on this site. It recently dawned on me that I made coconut flour pancakes for the first time seven years ago. 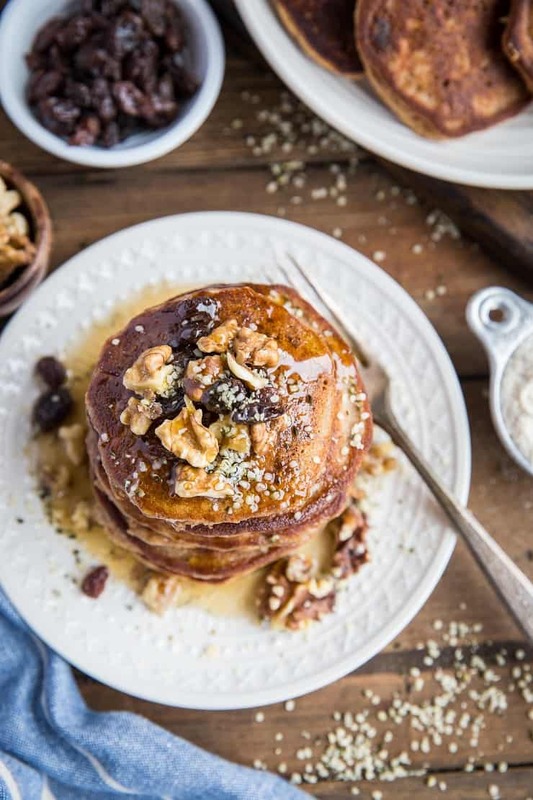 Since then, I have posted Lemon Poppy Seed Coconut Flour Pancakes, Fluffy Citrus Coconut Flour Pancakes, Lemon Ricotta Coconut Flour Pancakes , Blueberry Coconut Flour Pancakes for One, Fluffy Apple Walnut Pancakes. I used my Basic Fluffy Coconut Flour Pancakes recipe as the base for this carrot cake edition. 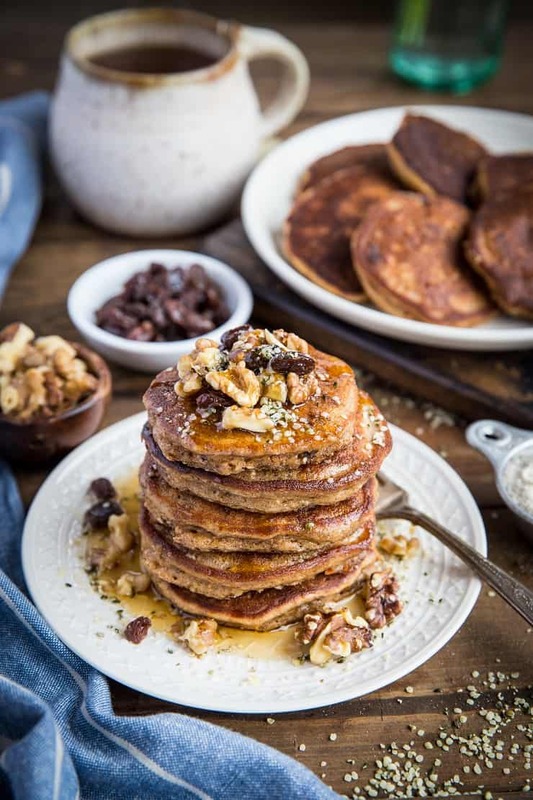 I simply added shredded coconut, carrot, cinnamon, and raisins to make these pancakes taste like the much coveted classic carrot cake. Serve them up with a pat of butter and pure maple syrup, and/or top them with chopped walnuts and raisins for a real good time. Because coconut flour is its own animal when it comes to grain-free flours, I don’t recommend trying to replace it with any other flour, as it absorbs 4 x more liquid than most other flours. 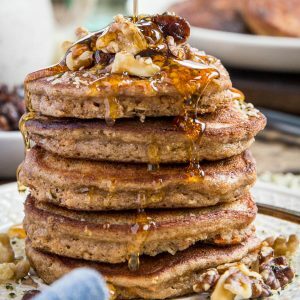 If you prefer almond flour over coconut flour, you can instead use my recipe for Almond Flour Pancakes as the base, and add the carrot cake ingredients from there. As usual, the pancake batter prep is a breeze. Simply add all ingredients for the base to a blender, blend, and then fold in the shredded coconut, carrot, and raisins. Cook them up on the trusty griddle, and you have yourself a healthy grain-free cake-for-breakfast situation. And if you’re like me and you’ve been itching for ALL THE CARROT CAKE lately, I’ve gotchu, boo. I recently posted this Carrot Cake Overnight Oats , Paleo Carrot Cake Banana Bread, Carrot Cake Fat Balls, and Grain-Free Parsnip Carrot Cake …and you can also dig my straight up Paleo Carrot Cake recipe if you want the real deal. Cheers to carrot cake errthang!! Add all ingredients except the last three (carrot, coconut, raisins) to a blender and blend until well-combined and smooth. Fold in the last three ingredients and allow batter to sit 15 minutes. This process will help thicken the batter. Heat 1 to 2 tablespoons of coconut oil in a large non-stick skillet (enough to generously coat the surface) over medium-low heat. Wait a few minutes for the skillet to warm up all the way. 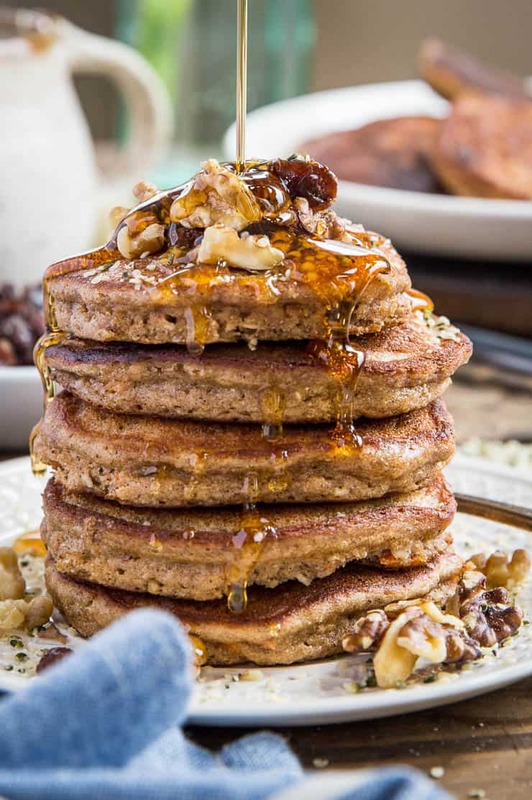 Serve pancakes with choice of grass-fed butter, chopped walnuts, raisins, almond butter, and/or pure maple syrup. Julia, My family likes banana pancakes and I am pretty sure you posted a recipe for that very item. Now I can’t seem to find it in your posts. Can you help me? All who I served your oatmeal cookies w brown rice flour gave high compliments! Thanks for easy and delicious recipes. I am starting to like to cook again BC of your blog. I’ve been craving carrot cake like nobody’s business lately and these cakes look like the perfect cure. So good! Hi Would this recipe work with flax eggs? Thank you looks amazing! Made these yesterday for a special Easter breakfast and they were delicious! The whole family loved them. Will definitely make them more often. Love the pancakes! Yummy Delicious. Thanks for sharing the recipe Julia. OMG look amazing!!! I can substitute de tapioca flour for almond flour?? Hi there! That substitution should work, just know that the pancakes won’t hold together quite as well (the tapioca flour is what helps bind them). So long as you’re careful when you flip them, you should be fine! Hope you enjoy! These look great. I love carrot cake! But I don’t see the calorie or card count in your blog. Can you tell what they are?